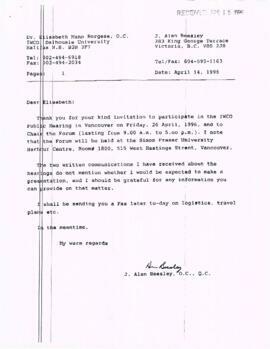 File contains correspondence with J. Alan Beesley about participating in the Independent World Commission on the Oceans public hearing in Vancouver, British Columbia (held on April 26, 1996). Included is a copy of Beesley's CV. File contains correspondence with the Malahat Review. Materials include two letters: one rejection letter, that is a partially handwritten critique asking Kerslake to submit again.